Drowsy driving is one of the most serious dangers on the road. Tired drivers are less able to pay attention, have slower reaction times and are less capable of making sound decisions. This resulted in over 72,000 crashes in 2013, according to the Centers for Disease Control and Prevention (CDC). Drowsy driving is dangerous for everyone who shares the road, and when commercial truck drivers are tired behind the wheel, the consequences can be even more hazardous. It is widely known that truck accidents are some of the most serious on the road. Commercial trucks are bigger, heavier and taller than other vehicles, creating a more severe wake of damage when they crash. As a result, the Federal Motor Carrier Safety Administration (FMCSA) has approved a new rule, which will go into effect this month, to establish an avenue for drivers to report instances in which they are encouraged or pressured to operate a vehicle more than the rules allow. The coercion rule, specifically entitled Prohibiting Coercion of Commercial Motor Vehicle Drivers, prohibits carriers from coercing drivers to operate in violation of the federal hours of service mandates and offers avenues for drivers to report misbehavior. The rule also allows the FMCSA to penalize offending carriers for infractions and protects those drivers who report misbehavior. FMCSA officials say they hope the new rule will help ensure the safety of all travelers on the road. 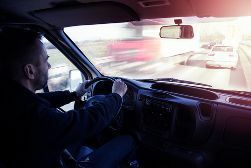 Though the new coercion rule will attempt to address a serious problem, some trucking companies have and will disregard this mandate, exposing travelers to the dangers of drowsy driving. If you or someone you love has suffered injuries in a truck accident and you suspect a tired driver is to blame, you may be eligible for compensation. Fill out a contact form to have a member of the experienced legal team at Morris James Personal Injury Group answer your questions today. Is a Trucker or Trucking Company Responsible for My Injuries?